There’s no doubt that having a comfortable and supportive mattress is crucial. A mattress that supports you properly and feels comfortable can help to reduce aches and pains and allows you to get the quality sleep you need for optimum health. However, the wrong mattress can cause a whole host of problems. Back pain and aching joints can result from sleeping on an unsupportive mattress. Furthermore, if you’re uncomfortable, you won’t wake up feeling fully rested and refreshed. High-quality sleep is vital to your all-round health. So, as you can see, choosing a mattress is an extremely important decision. More and more people nowadays are considering air mattresses to sleep on. Many of us have slept on an air mattress during a camping trip or as a spare bed. However, you may be wondering whether you can use an air mattress as your main bed. So, what is an air mattress and how do you choose the best one? Read on for our handy buyer’s guide and top 10 reviews. Don’t have time to read the whole article? 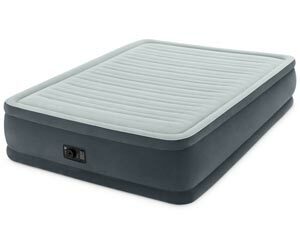 Then we recommend you take a look at the SoundAsleep Dream Series with ComfortCoil Technology. This is our absolute favourite air mattress due to its comfortable and luxurious feel, quick and simple inflation and durable construction. If you think an air mattress may be a good option for you, it’s a great idea to check out expert reviews to find the very best option for you. 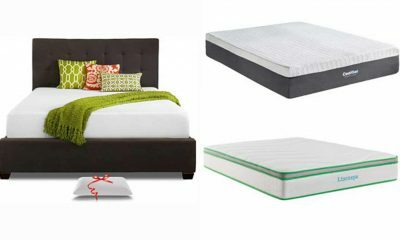 Here are the latest reviews of the 10 best air mattresses. The SoundAsleep Dream Series air mattress has truly earnt its spot at the top of our list. This is a more luxurious option which provides a level of comfort exceeding that of regular air mattresses. This is down to its two-layered design. The lower layer is a regular air chamber which functions like a normal air bed.However, the top layer of the mattress contains air coils, which help to give a better level of support. Also, this helps to reduce motion transfer for couples, limiting your awareness of your partner’s movements. 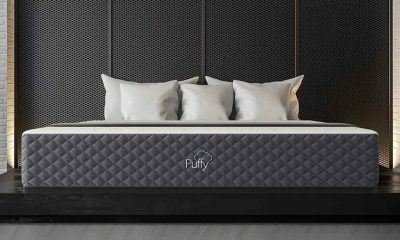 Furthermore, this mattress is made of highly durable PVC which helps avoid punctures. 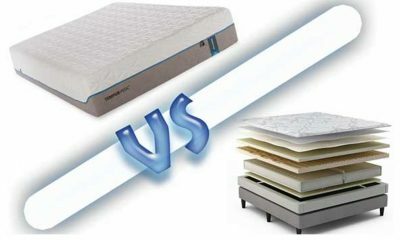 Dual support: The two layers of this mattress provide an excellent level of support. 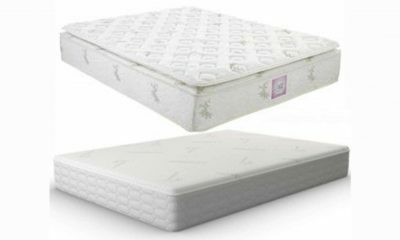 The lower air chamber provides a firm and supportive base, while the coils in the upper layer make the bed very comfortable to sleep on. 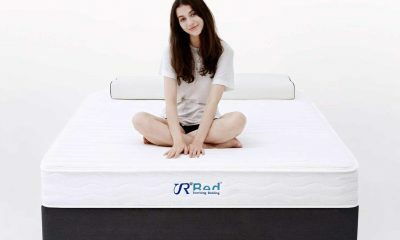 This makes the mattress especially suitable for couples as the coils reduce motion transfer. Quick inflation: This mattress has an inbuilt air pump which allows you to inflate the bed with a click of a button. In fact, the bed can transform from flat to completely inflated in around 4 minutes. This is great if you have house guests and want to inflate the bed in a hurry. High weight limit: This fantastic mattress can hold up to 500lbs combined weight. Therefore, it can comfortably accommodate most couples without a problem. Doesn’t blow up as quickly as some other beds, although we think 4 minutes is still pretty speedy! At first, there will be a period where the material stretches, and it will need to be re-inflated more often. However, this is a con of air mattresses in general and not a specific negative related to this mattress. 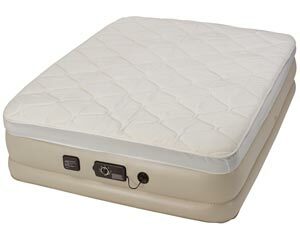 The fantastic Serta Raised Air Mattress uses a special pump system called a ‘Never Flat’ pump. This really makes it stand out from the crowd. The ‘Never Flat’ system uses two separate pumps, with one responsible for the first inflation and the other keeping it topped up with air as you sleep.Therefore, once you’ve chosen your firmness, the mattress will continue to give the same level of support all night long. This helps to solve the ‘stretching’ issue mentioned above. So, is the Serta mattress a good choice for you? Read on for our in-depth review. Air coils: Air coils helps to give an even support across the whole surface of the air mattress. This makes it more comfortable to sleep on than many other air mattresses. Also, this helps to reduce motion transfer, making it a great choice for couples. Easy to pre-set: The Serta air mattress comes with an easy-to-read dial which allows you to pre-select your desired level of firmness. Also, the ‘Never Flat’ pump then maintains this firmness while you sleep, so there will be no need to re-inflate even if you’re sleeping on the mattress for several nights. Flocked upper layer: The top of this mattress has a soft and cosy flocking. This gives a feel more similar to sleeping on a regular mattress. Also, a layer of flocking can help to keep sheets securely in place. 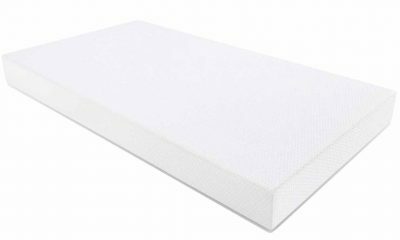 This prevents the slippage issues that are so common with air mattresses. 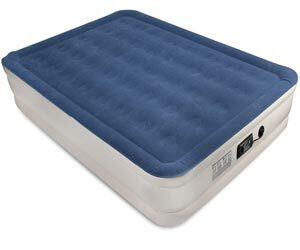 The Insta-Bed raised air mattress is another bed that uses a Never Flat pump system. This means that the air will continue to be topped up if necessary as you sleep, allowing you to enjoy the same level of consistent firmness.Furthermore, air coils make the comfort of this bed extremely good for a temporary bedding option. 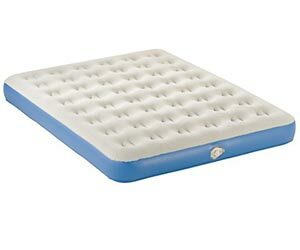 Like the first two options on our list, this air mattress has a cosy flocked top and is non-slip, so it won’t slide if you decide to use the mattress on the floor. Let’s take a look at the Insta-Bed Raised air mattress in more detail. Supportive air coils: This structure helps to give an equal level of pressure across the whole body of the air bed. This makes it more supportive to sleep on than many other air mattress options. Also, this helps to reduce motion transfer, so you should be less aware of your partner’s movements while you sleep. Never Flat pump system: This inflation system uses two separate pumps, with one responsible for blowing up the bed in the first instance and the other maintaining the pressure as you sleep. Therefore, once you’ve chosen your firmness, the mattress will remain the same firmness all night long. Flocked top: The upper of this mattress has a cosy flocked finish. This improves the overall comfort of the mattress. Also, a layer of flocking stops your sheets slipping off the mattress while you sleep. This prevents the slippage issues that are a common problem with many regular air mattresses. This is a great option if you’re looking for an air mattress to take camping, as it is specially designed to be used outside. It doesn’t require an electricity supply, although you can inflate it with the electric pump provided in around 3 minutes. This makes it one of the quickest to inflate on our list. It can also be used as a temporary bed for house guests, so all in all this is a very versatile product. So, why do we recommend the SoundAsleep air mattress? Read on to find out! Quick inflation: Using the electric external pump, this bed will be fully inflated and ready to sleep on in just 3 minutes. This makes it extremely convenient if you want to put it up in a hurry for overnight guests. However, if you’re camping and don’t have access to an electricity supply, you could inflate the mattress manually. Great for sleeping outdoors: This mattress is made from extremely durable and hardy PVC. This, combined with the coiled air chambers, makes it extremely suitable for sleeping outside, as there is a lower risk of punctures. Portable: Once it’s deflated, the SoundAsleep Camping Series air mattress is very light. Also, it comes with a handy carrying case to allow you to move it from place to place with ease. This makes it simple and convenient to store or take on a camping vacation in your car. As the name suggests, this air mattress is a premium product. With inner air coils and a built-in inflation pump, this is comfortable and sturdy enough to use as your permanent bed if you wish. However, this mattress is less suitable for outdoor camping as it requires an energy supply to inflate. As this mattress has a height of 18 inches, this makes it extremely convenient and easy to get in and out of bed. Let’s have a closer look at this product’s key features. Inner air coils: Inner air coils help to maintain an equal level of pressure across the entire mattress while you sleep. This makes it more supportive to sleep on than many other air mattress options. Also, it works to limit motion transfer, so you should be less aware of your partner’s movements during the night. Extra side support: This mattress has an extra layer of support around the outside of the mattress. This helps it to keep its shape, especially if you tend to sleep right to the edge of the mattress or like to sit on the side. This also helps to prolong the overall life of the mattress. Flocked top layer: The top of this mattress is covered in a flocked material. This gives a more luxurious and comfortable feel during sleep. Also, the flocking helps to keep your sheets securely in place while you sleep, which is a major improvement on traditional air beds. If ever there was an air mattress that would suit the sleep needs of almost anybody, this is it. 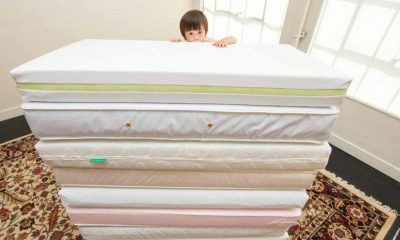 At 22 inches in height, this mattress is far easier to get in and out of than many options that are lower to the floor. This is particularly useful if you or your house guests are seniors or struggle to rise from a lower bed.This mattress also provides a very good level of support and comfort. It also has a convenient internal inflation system, so you can simply plug it in and watch it inflate in under 4 minutes. So, why do we love this mattress so much? Read on for our expert review. Speedy inflation: The Intex Comfort airbed has an integrated air pump which allows you to inflate the bed by simply plugging it in and switching it on. Overall, the entire inflation process takes under 5 minutes. This is extremely convenient if you want to inflate the bed for guests very quickly. Flocked top layer: The top of this mattress is covered in a plush and luxurious flocking. This gives a cosier feel during sleep. Also, the flocking helps to keep your sheets securely in place while you sleep. Finally, this also helps to keep you warm while you sleep. As a cold sleeping surface can be a grumble with many air mattresses, this is a great feature. Extra height: An impressive 22 inches of height makes this akin to sleeping on a regular bed. Therefore, it is much easier to get in and out of. Therefore, this makes the mattress much more accessible for seniors and those who struggle to get up from a bed that’s very low to the ground. This air mattress is designed to be a temporary bed and is suitable for outdoor use on camping trips. However, it is unsuitable to be used for any other purpose than as an occasional temporary bedding solution. 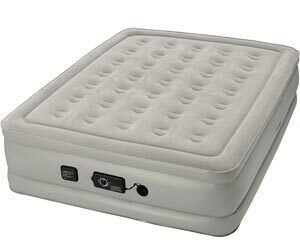 This mattress is a more basic and budget option, and therefore does not have an internal pump. That being said, it can provide a good level of comfort as it has inner air coils for better support. So, this could be a good option if you want to buy an air mattress for occasional use. Let’s take a closer look at the ALSP Mountaineering air mattress. Inner air coils: Inner air coils help to maintain an equal firmness throughout the entire mattress. This makes it more supportive to sleep on than many other air mattress options. Therefore, this is a more comfortable and supportive option than many other basic mattresses designed for camping. 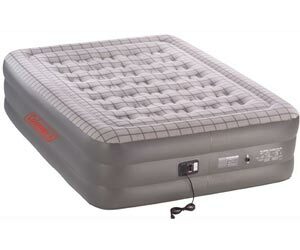 Suitable for outdoor use: This air mattress is made of very heavy-duty PVC, making it resistant to punctures. Therefore, the bed is extremely suitable for sleeping outside. It is also highly portable, so it is ideal for taking on camping trips and outdoor vacations. The Aerobed Classic Air Mattress is another affordable, budget option if you want to buy an air bed for occasional use. This could be ideal if you will only be using it to accommodate house guests every now and then.However, it is not suitable to be used as a permanent bed. Like most other air mattresses in the same price range, this mattress does not have an internal air pump. Coming in either a single or a queen size, you can select depending on the space you have available. Let’s take a closer look at this air mattress. Air coil construction: Inner air coils ensure that the firmness of the entire mattress is consistent. This makes it more supportive to sleep on than many other air mattress options. Therefore, this is more supportive to sleep on than many budget-friendly options that rely on basic air chambers for support. External pump: As with almost all air mattresses in this price range, the Aerobed Classic Air Mattress relies on an external air pump for inflation. This can be both an advantage and a drawback. On the one hand, this means you can use a foot pump if you’re camping and there is no electricity supply. However, you will need to remember to take your air pump with you. The Intex Pillow Rest air mattress is another great option if you are looking for an indoor air bed that provides guests with a more luxurious place to sleep. At 16 ½ inches, this has a height more like a regular bed. Therefore, it should be easier to get in and out of than some of the more budget options on this list. It also has an integrated pillow, which adds to the overall comfort of the bed. The mattress has an integrated air pump, so there’s no need to go digging around in your closet for an external pump. However, this makes it less suitable for outdoor use. 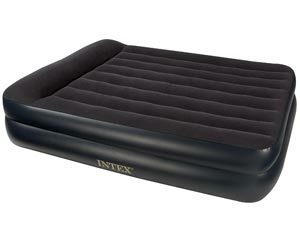 So, is the Intex Pillow Rest air mattress the right choice for you? Read on to find out! 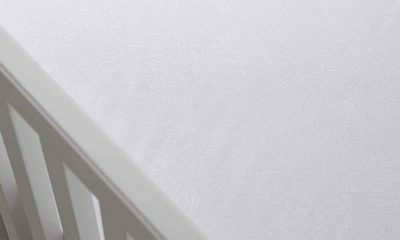 Wave beam air chambers: Unlike most of the other options on our list, this mattress uses wave beam air chambers to provide support instead of air coils. 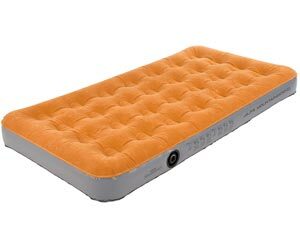 This allows it to support a higher weight capacity of 600lbs, which is one of the highest capacities we’ve seen in an air mattress. Built-in pillow: For some, the built-in pillow of this mattress may be a big positive. This provides a little extra support under your head, which can improve overall comfort. 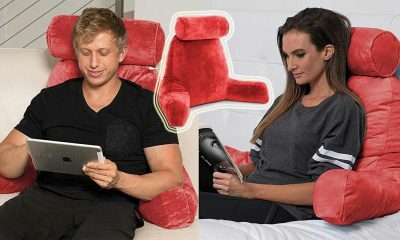 This can also be handy if you don’t have a spare pillow or cushion to hand. Integrated air pump: The integrated air pump means that you can simply plug your air mattress in at the mains and allow it to inflate. You don’t need to worry about locating an external pump or remembering to take it with you on vacation. Your bed will be fully inflated and ready to use in just 4 minutes. However, this type of pump system makes it less suitable for use outdoors. This dual-purpose air mattress is pretty unusual and combines the benefits of an air mattress with those of a sofa bed. This is a novel idea that we thin may suit some people very well. 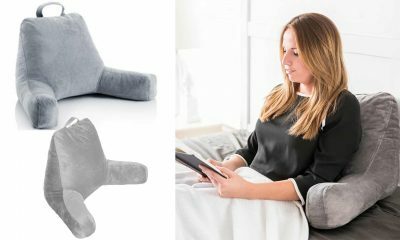 This product can be folded up to function as a 2-seater sofa, and then unfolded when it’s time for bed. It’s extremely comfortable when used as both a sofa or a bed. Intex point out that you can change the size of the sofa by altering how much you inflate it, which is good news if you’re short on space. Let’s take a closer look at the Intex Pull-Out Sofa Inflatable bed. Speedy inflation: This product has 3 separate air chambers that need to be inflated separately. However, this can be done extremely quickly using an external electric air pump. However, bear in mind that external pumps do not come included in the price. You will need to purchase them in addition to the air mattress. Dual-purpose: Essentially this functions as a sofa bed but without the huge price tag. Therefore, you can use it as a sofa during the day and fold it out to sleep on at night. It also makes an excellent and convenient spare bed for house guests when needed. The first thing you need to understand is what an air mattress actually is. Essentially, an air mattress is a bed that can be inflated. Therefore, you are supported by compressed air from within the body of the mattress. Modern air mattresses are a modern and more sophisticated version of the air beds you may have slept on during camping trips. However, proper air mattresses are designed to be used inside. Air mattresses are designed as temporary bedding but is possible to use an air mattress as your full-time bed. However, most people don’t use them for this purpose. 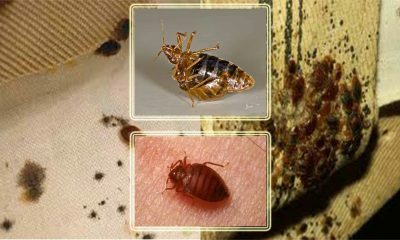 Instead, they are often used as spare bedding for overnight house guests. Air mattresses are ideal for this purpose because they can be deflated, rolled up and stored without taking up much space. Therefore, they’re a great option if you don’t have space for a sofa bed or futon. 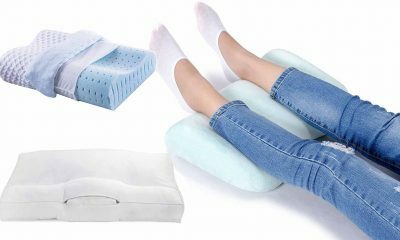 Also, as the firmness can be adjusted by adding or removing air, they are a far more comfortable option than many other temporary beds on the market. When you’re shopping for an air mattress, it can be hard to know what to look for. This is because air mattresses are less well-known than other kinds, so it’s generally harder to find the expert information you need. Luckily, at Matter Mattress we have expert knowledge on even unusual mattress types. When you’re looking for an air mattress, there are several key questions you need to ask yourself. These will help you find the right option for you. So, read on for our handy guide. How Do You Want To Inflate The Bed? Some air mattresses come with integrated pumps, so you don’t need to go digging in the closet to find your electric or manual pump. Instead, you simply plug it in and away you go. If you intend to use the air mattress as your main bed, then an integrated pump is probably going to prove much more convenient. So, you can simply add more air to your mattress whenever the mood takes you. On the other hand, air mattresses with integrated pumps tend to be a little more expensive. If you’re only using your air mattress as an occasional guest bed, you may not mind having a separate pump to save some money. Will You Be Sleeping On The Bed Permanently? If you’re planning on using an air mattress as your permanent bed, you’ll need to take much more care over selecting the right model. While any niggles may be merely annoying on a guest bed, they can become a major issue if you sleep on it every night. 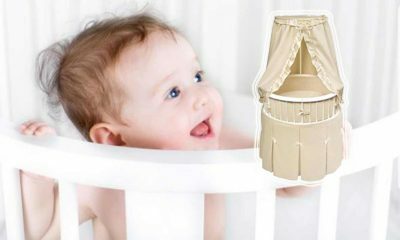 The most important thing to check out is that the bed is durable, comfortable and not prone to releasing air too quickly. While some escape of air is completely inevitable, you don’t want to be constantly topping up your air mattress, especially during the night. As we mentioned above one drawback of an air mattress is that you are unlikely to find anything larger than a Queen size. If you’re using it as your permanent bed, consider whether this will give you enough space to stretch out comfortably. Also, it’s worth taking into consideration the size of your bedroom. If you have an extremely large bedroom, you may need a larger bed to make the room appear in proportion with your bed. If you’re purchasing your mattress as a guest bed, a queen should probably suit almost any guest on a temporary basis. You may also decide to purchase a single air mattress. However, bear in mind that this will be of little use if you have a couple come to stay. You should also read : What is The Difference Between a King and Queen? If you will be sharing the bed with a partner, or it’s likely that you will have couples to stay, this is an important point to take into consideration. Some air mattresses come with additional features that make them particularly suitable for couples. First, you may want to consider an air mattress with dual air chambers. This allows you to adjust the firmness differently on either side of the bed. Therefore, each partner can select the level of firmness that best suits their needs. Also, some air mattresses come with inner coils. This helps to reduce motion transfer, which means you will be less affected by your partner’s movements in the night. As motion transfer is a major grumble with more basic air mattresses, you need to think about this carefully before you buy. This is especially true if it will be your main bed. How Heavy Are The Sleepers? Unlike regular mattresses, air mattresses have an upper weight limit. Therefore, some can accommodate much more weight than others. Therefore, it’s important to check that the mattress you select a mattress that can support the combined weight of anyone sleeping on it. Will You Be Using Your Air Mattress Outdoors? If you are a keen camper, then it’s important to ascertain whether the air mattress can be used outdoors. Some models are designed for indoor use only. Furthermore, certain inflation systems may be difficult or impossible to use outside. Therefore, if you want to use your air mattress to sleep outside, this is an extremely important point to consider. Do You Need a Special Base for An Air Mattress? This depends on whether or not you intend to use the air mattress as your permanent bed. If you’re planning to use it for overnight guests, then chances are it will be more convenient to set up the air mattress on the floor. This means you won’t need to give up storage space for a bed base. Also, sleeping on an air mattress on the floor for a few nights will be perfectly comfortable. However, if you plan on sleeping on your air mattress full-time, you can purchase special bed bases that are compatible with air mattresses. 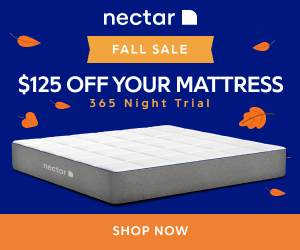 You will probably find this preferable to sleeping with the mattress on the floor, as the height will be more convenient for getting in and out of bed. Furthermore, this also allows you the option of using the space under the bed for storage. If you’re considering buying an air mattress, it’s important to understand what the benefits could potentially be. This will help you to decide if an air mattress is right for you. This is especially true if you think you might want to use an air mattress as your main bed, as you will be sleeping on it night after night. So, what are the main benefits of an air mattress? While you probably won’t be inflating and deflating our air mattress so much if you sleep on it all the time, this is a major benefit if you’re purchasing an air mattress as a guest bed. Most modern air mattresses can be inflated and deflated in under 5 minutes using an electric pump. Therefore, you can quickly set up the bed at bedtime and deflate it away ready for packing extremely quickly and conveniently. If you’re on a budget, or just don’t want to spend much on a mattress that will only be used occasionally, then an air mattress is a great choice. They’re much cheaper than regular mattresses, even if you choose to buy a more deluxe model. Another great thing about air mattresses is that they can be moved around very easily. Many even come with a handy carrying case to make taking the mattress around with you a breeze. Obviously, if you use it as your main bed then this is less crucial. However, this is a major advantage in a temporary bed. You can simply roll it up into a compact case and take it on trips, move it from place to place in the house and store it away when not in use. If you’ve ever tried moving a regular mattress around, you’ll understand what a major positive this feature is. A major problem with many regular mattresses is that they can sag over time. This is especially true with innerspring mattresses. Furthermore, sagging renders your mattress unsupportive and uncomfortable and will have to be replaced. However, air mattresses don’t sag because they keep their shape through being filled with compressed air. If your mattress feels too slack, you can simply add more air to make it firmer. Because they support you with compressed air, you can adjust the firmness of an air mattress extremely easily. To make it firmer, you simply need to add more air, while you can make it softer by letting a little air out. With a regular mattress, you’re stuck with the firmness you select in the store. Some more advanced air mattresses even allow you to adjust the firmness differently on each side, so that each partner can have a sleeping surface that suits their needs. 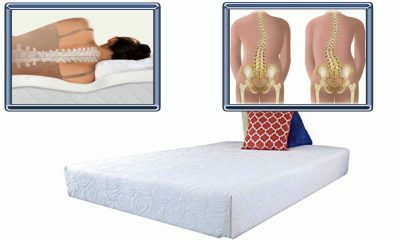 It’s important to understand that air mattresses are not specifically designed to help with back pain. However, you can make the mattress very firm by fully inflating it. 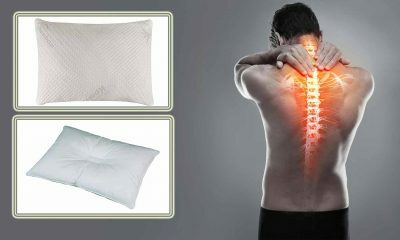 Some people with back pain find that a firmer mattress supports their spine more comfortably. If this is the case for you, an air mattress may help to relive your back pain at night. Also, you can adjust the firmness if your mattress needs in regard to your back-pain change over time. Of course, this is not an option with a regular mattress unless you have a mattress with removable layers or an inner air chamber. These options are both more expensive than an air mattress. As you can see, there are many positives to owning an air mattress. However, there are also some potential drawbacks. It’s vital that you’re aware of these before you make an investment. This is especially true if you intend to use an air mattress as your full-time bed, as any niggles will become a full-on problem. So, let’s take a look at some of the possible disadvantages of owning an air mattress. If you’ve ever shopped for a regular mattress, you’ll have noticed that there are a huge range of sizes to choose from. This means that you can find an option to suit your needs in terms of space. However, air mattresses come in a much lower range of sizes. Almost all air mattresses only go up to a queen size because they are primarily designed as temporary, portable beds. If you’re planning on using it for this purpose, this probably won’t be such an issue. However, for those intending on using an air mattress as their main bed, this could be a problem. If you are particularly tall or need a lot of space to sleep comfortably at night, you may prefer a king size or larger. It’s unlikely you’ll be able to purchase an air mattress this large. Usually, regular mattresses have a warranty of at least 10 years. Some come with even more generous warranties stretching the lifetime of the mattress. However, air mattresses usually have much shorter warranties. As a rule, it’s unlikely you will find an air mattress with a warranty of longer than a year. However, the upside is that air mattresses are much cheaper than most other options. Therefore, the short warranty will probably be offset by the fact that you can simply repair or replace your mattress reasonably cheaply. Because they’re inflatable, any air mattress has the potential to develop a puncture. 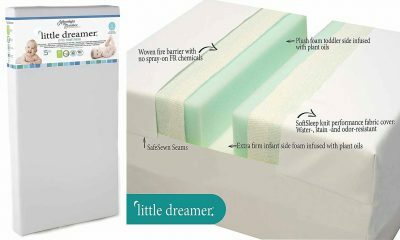 This can be extremely inconvenient and will render your mattress useless until it can be repaired. 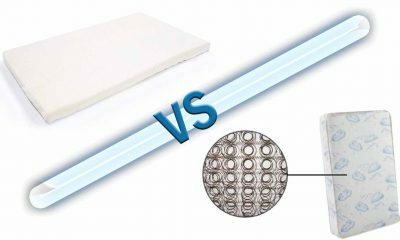 As most modern air mattresses are made of heavy duty PVC, they’re less likely to develop a puncture than the airbeds of yesteryear. Also, small punctures can usually be repaired easily at home using a repair kit. However, if you have a cat, you may wish to reconsider your choice if you want to use an air mattress as your permanent bed. Unfortunately, many cats will make short work of an air mattress with their claws! 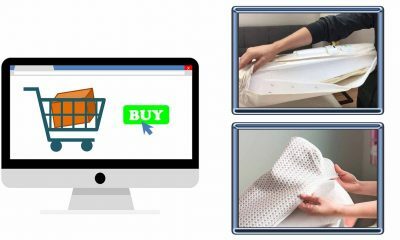 When you’re shopping for any mattress, it’s only natural that you’ll have a lot of questions and queries. This is even more likely if you’re considering a more unusual type of bed such as an air mattress. 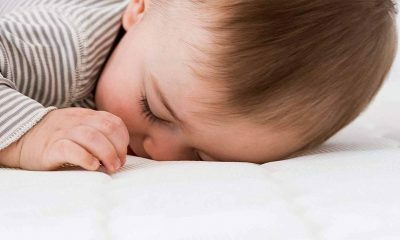 At Matter Mattress, we often get asked questions about air mattresses and how to choose the very best one. Here are some of our most frequently asked questions and our expert answers. Can I use an air mattress as my main bed? Air mattresses are not usually designed to be used as a permanent bed. However, there’s no reason why you can’t use an air mattress permanently if you find it comfortable. However, make sure you look for an air mattress that is highly durable if you want it to be able to withstand nightly use. Why does my air mattress lose air? Unfortunately, all air mattresses will lose at least a little air over time through the inflation valve. If the air loss is very gradual (over the course of many days), this probably doesn’t indicate an issue. You simply need to add a little more air every now and then. However, if your air mattress starts to sag very quickly, this would indicate a puncture. In this case, you will need to repair the mattress using a repair kit. How do I find a leak in my air mattress? If you suspect your air mattress has a leak, you will need to locate it in order to carry out a repair. 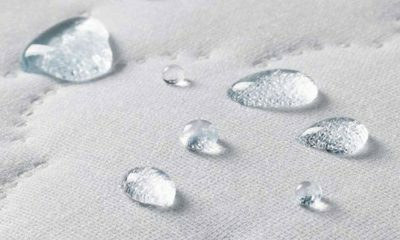 The simplest way to locate a leak is to apply pressure to the mattress and listen carefully to see if you can hear the air escaping from a particular area. If you can’t, then another way to look for a puncture is to submerge the mattress in water. Then you can look for air bubbles coming from the leak. You can do this in a bath if your mattress is small enough. However, be careful not to get an integrated pump wet. How do I repair a leak in an air mattress? If your air mattress is leaking, you will need to repair it before you can sleep on it. Usually, air mattresses come with a puncture repair kit. Alternatively, you should seek advice from the manufacturer. Can I use my bed frame with an air mattress? As a rule, any bed base can be used with an air mattress as long as it is in good condition. Any protruding springs or splinters of wood could possibly puncture your air mattress. Therefore, you should inspect it first before using it. Also, make sure that the air mattress is the correct size for your bed base. Can you clean an air mattress? If it gets dirty, an air mattress is easy to clean. Using a gentle household soap or detergent mixed with water will work just fine as long as you use a soft brush to avoid damage. Also, never try to wash an air mattress in a washing machine or use any harsh chemicals. Both of these methods are extremely likely to irreparably damage your air mattress. Can I use an air mattress as my permanent bed? Generally, you can’t use every air mattress as a permanent bedding solution. If you wish to do this, you will need to purchase a very sturdy ad durable model. 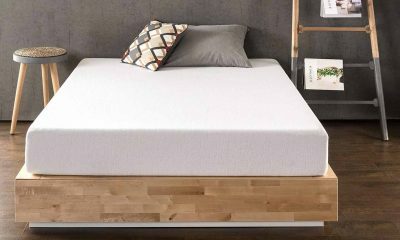 As most types are designed to be used every now and then, you should check the manual to see how much use your mattress is designed to withstand. Are air mattresses good for back pain? If you inflate the air mattress to the correct firmness for your needs, it can be very supportive and potentially help with back pain. If you’re concerned about the impact an air mattress may have on your back condition, you should seek advice from your doctor first.